Olivier Dibie showing the Tokyo 2020 and his Theater de Liege logo side by side. Copying is a key component of learning. There is nothing new under the sun, and we stand on the shoulders of giants…to shamelessly borrow these words of wisdom. Many well established writers may have started off by mimicking Ernest Hemmingway’s simple, direct tone. Microsoft’s Windows GUI was borrowed from Apple’s Macintosh GUI which was borrowed from Xerox’s PARC research. The line between copying and creativity is fine. My favorite example is George Harrison’s 1970 “My Sweet Lord“, which was the center of a copyright infringement lawsuit where Harrison was ruled to have subconsciously plagiarized Ronnie Mack’s 1963 song “He’s So Fine“. George Harrison has such a body of work that screams creativity that no one will begrudge him this. And to be honest, I was going to give designer, Kenjiro Sano, the benefit of the doubt when his Tokyo 2020 logo was thought to be a copy of the Theatre de Liege logo, created by Olivier Debie. But the recent revelations that Sano’s firm essentially traced designs of another firm for use in a major marketing campaign by giant Japanese beverages corporation, Suntory, is sad. Suntory ended up pulling those blatantly copied designs from their marketing campaign. 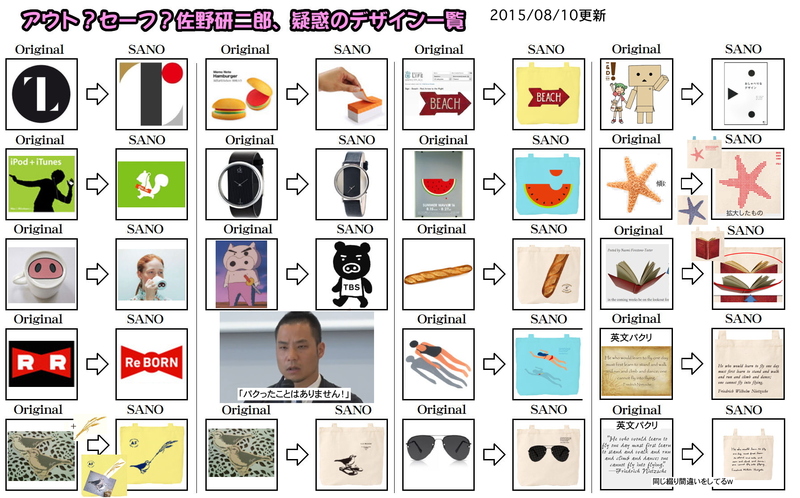 You can see in this illustration below recent designs by Sano where he borrowed in some cases, and copied in others. Did he break the law? The more important question is, did he hurt his reputation? Posted in Others, Pop Culture, Tokyo 2020 and tagged 2020 Olympics, copying, copyright, George Harrison, George Stalk, He's So Fine, James Abegglen, Kaisha, Kenjiro Sano, My Sweet Lord, Olivier Dibie, plagiarizing, Suntory, Theatre de Liege, Tokyo 2020 logo. Bookmark the permalink.